We love libraries. We choose to work in them for our PR agency, SharpOrange. No WeWork, expensive office space, no jitters-inducing Starbucks or even home offices (well, occasionally) for us! 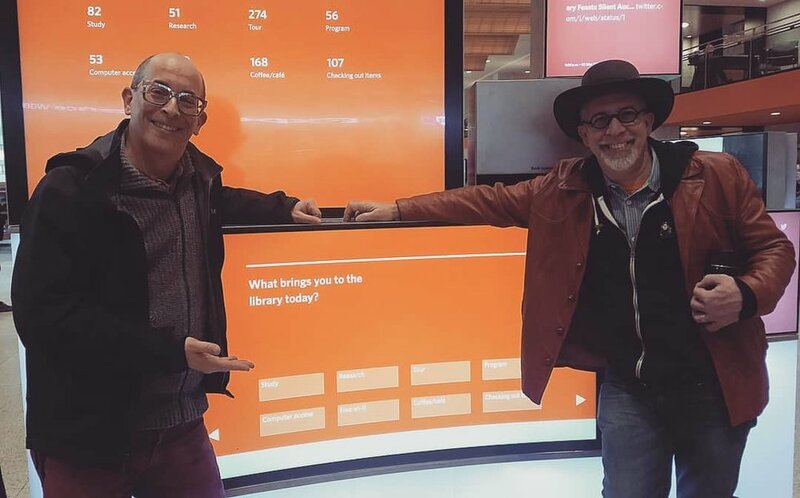 We are Adam Zand and Greg Peverill-Conti, the principals of SharpOrange and the guys behind Library Land. Since late 2017, we’ve visited more than 150 libraries across Massachusetts - a strong start to our goal of visiting every library in the state. We also made side trips and saw libraries in Florida, New Hampshire, New York, Pennsylvania and South Carolina. In April 2019, we’ll be driving from Savannah to Boston (by way of New Orleans) to visit libraries across the South and the mammoth Library of Congress. When we visit a library, we rate it on 11 criteria: parking/transportation, WiFi, meeting rooms, cleanliness, completeness, community, friendliness, restrooms, noise, comfort level and the all-important "Good place to work?" Of course, we also work, meet with clients, talk to librarians, patrons, get inspired and almost always leave in a positive and productive frame of mind. At SharpOrange, we start engagements by asking two questions: who do you want to reach and what do you want them to do? In Library Land there are also two questions we ask: what brings you to the library today and what do you love about libraries? We created Library Land for people who love libraries - and to encourage more people to fall in love as well. Check out our reviews, read our stories, consider the lessons we’ve learned, dig into the numbers in our rankings, track our travels on our map of libraries and follow us on Instagram. Lastly, please tell us about your favorite library and tag away at #LibraryLand and #LibraryLandProject. Email us at info@sharporange.com to let us know what you think. Twelve libraries AND a movie - what a week in Libary Land! Five fantastic libraries in this fine week in Library Land! We enjoy cocktails on the opening day of the Boston Public Library’s new Map Room Tea Lounge. The somewhat silly story of how this started. Be sure to follow us on Instagram! We’re @LibraryLandProject!